(above) A lintel from the 10th century royal temple called Bakong shows a a group of men of authority (as symbolized by their batons and headgear) riding on the backs of multi-headed nagas. 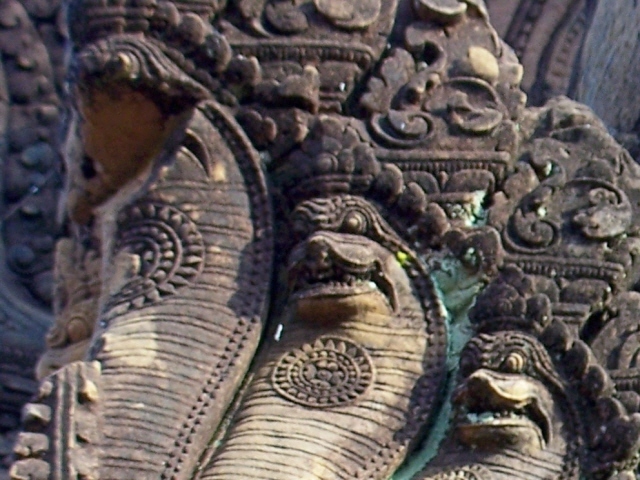 The naga to the extreme left appears to be wearing a crown on each of its three heads. The head in the middle of the lintel is a kala, representing the destructive aspect of time and symbolically connected with Shiva. 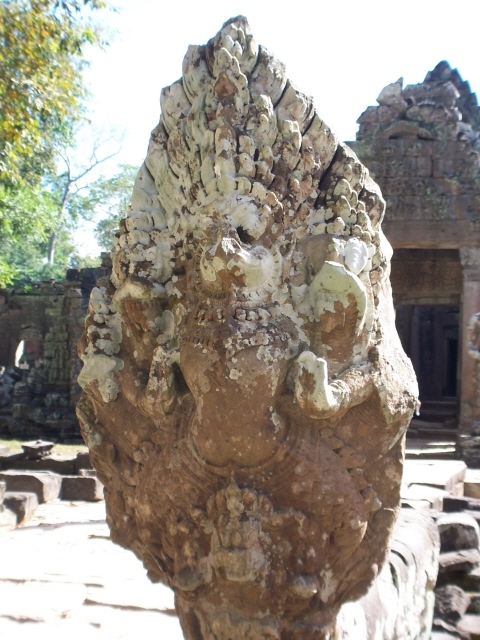 The heads with trunks to the left of the kala are makaras, mythical sea monsters with the body of a crocodile and the trunk of an elephant.Naga. In Indian and Khmer mythology, the term “Naga” is used as a name for a race of serpents with human traits, as well as for a people or ethnicity participating totemically in the nature of serpents. Nagas appear frequently in the Mahabharata, where they are cast more frequently in a negative than in a positive light, and are portrayed as the enemies and prey of Garuda and the birds. At Angkor, they are often positioned as stone guardians of temples and other buildings. A story about the origin of the Khmer people has it that they are descended from the union of an Indian Brahmana named Kaundinya and a Naga princess named Soma. The story thus reflects the plausible historical thesis that the Khmer civilization emerged from a union of Indian and indigenous elements. According to the story, Kaundinya left India in search of a better life and came to the land of the Nagas. He defeated the Naga princess in battle and spared her life when she agreed to marry him. Kaundinya became king of the land and Soma his queen, and the Khmer people were descended from their union. The story of Kaundinya and Soma is probably a hybrid of three sources: (1) the account of the Chinese diplomat K’ang T’ai, who visited Funan, the predecessor state to Angkor in Cambodia, (2) the account of the Cham king Prakasadharma, who erected a stele in which he claimed descent from Kaundinya, and (3) the oral traditions of modern Cambodia, the roots of which may not be apparent. K’ang T’ai, a Chinese envoy to Funan in the mid-third century A.D., reported that Funan had been founded by Kaundinya at the direction of a genie who also provided him with a divine bow. When his ship arrived in Cambodia, a local princess tried to capture it. Kaundinya, however, used his bow to repel the attack and to force the princess to surrender. They were married, and Kaundinya took command of the country. The Chinese diplomat Zhou Daguan, who visited Angkor in 1296 A.D., reported in his travel memoires that at night the Khmer king slept in a tower that was home to the soul of a nine-headed Naga, the lord of the country and the kingdom. Every night, the Naga would assume the form of a woman and would sleep with the king. The tower was so sacred, Zhou reported, that not even the king’s senior wives dared enter. Here are some other stories about prominent Nagas. The first two are from the Mahabharata; the third is from the literature of Buddhism. The links are to the source texts at sacred-texts.com. Ulupi abducts Arjuna. Ulupi was a Naga princess who lived deep below the the Ganga river. Arjuna was a married super-hero sojourning temporarily in the forest. One day, when Arjuna was in the river performing his ablutions, Ulupi shot up from the deep, seized him, and dragged him under underneath the surface. Fortunately for Arjuna, Ulupi’s objective was love, not food, and he was welcomed alive into the realm of the Nagas. Though he protested that he was married, his arguments were soon overcome by the determined and clever Ulupi, and the two made love on the river bed. The next morning, Ulupi returned him to the surface, and Arjuna went into the mountains. The princess, however, soon found that she was with child. After a time, she gave birth to a son named Iravat, who grew up in the realm of the Nagas and became a competent warrior in his own right. Rejoining his father and fighting on the side of the Pandavas in the Battle of Kurukshetra, he was slain by the Rakshasa Alamvusha when the latter used his powers of illusion to assume the form of Garuda. Aswasena attempts to take revenge. Aswasena was the sole serpent fortunate enough to escape from Khandava forest when fire-god Agni and super-hero Arjuna joined forces to massacre its inhabitants. He was saved by the ruse of his mother, who sacrificed her own life in the process. For this, he swore revenge. The opportunity to get even with Arjuna presented itself when the super-hero squared off at the Battle of Kurukshetra with the equally formidable Karna. Aswasena emerged from the earth and, assuming the form of an arrow, quietly slipped into Karna’s quiver. Unwittingly, Karna pulled Aswasena out of the quiver, fitted him to the bow, and fired him at Arjuna. The vengeful Aswasena streaked through the air like a falling meteor. Indeed, it would have been Arjuna’s final hour but for the timely intervention of his charioteer and guardian angel Krishna, who forced the wheels of the chariot on which Arjuna was standing downward into the dirt. As a result, Aswasena zoomed overhead, managing only to knock Arjuna’s crown from his head. Disappointed though not disheartened, the serpent returned to Karna and asked to be fired again, but the latter’s pride prevented him from accepting any offer of assistance in the duel. The furious Aswasena then proceeded against Arjuna on his own. Seeing him on the way, Arjuna contemptuously mused to Krishna, “Who is that snake that advanceth of his own accord against me, as if, indeed he advanceth right against the mouth of Garuda?” Reminded by Krishna that the serpent came on a mission of revenge, Arjuna fired a deadly salvo of arrows that brought Aswasena’s life to an end. Mucalinda shields Buddha. Buddha had just achieved Buddhahood, and was meditating at the foot of the Mucalinda tree and experiencing the bliss of emancipation, when a cloud brought seven days of rainy, cold weather. At that moment, the attentive and pious Mucalinda, king of the serpents, came up from the ground in order to protect Buddha from the elements. Mucalinda wrapped his coils gently around Buddha’s body to keep him warm, and spread his hood over Buddha’s head to keep him dry. When the storm had passed, Mucalinda assumed the form of a young man and gave reverence to Buddha. Related pages on this website: 2 Banteay Srei (the full story of the burning of Khandava Forest, as depicted in a bas-relief at the 10th century temple of Banteay Srei); 7 Garuda (life and deeds of the Nagas’ greatest enemy); 8 Churning the Ocean of Milk for Elixir of Immortality (story of how the Devas and Asuras used the serpent king Vasuki to get the elixir); 14 Angkor Wat (various bas reliefs involving Nagas). Garuda and Naga are represented together on the city wall at Preah Khan. Garuda as usual is the victor in the encounter; thrusting out his chest, he treads one vanquished Naga underfoot and holds another aloft as a trophy. At Angkor, Naga is generally represented as a hooded serpent like a cobra, often with several heads arranged in the shape of a fan. Garuda is sometimes depicted against the fan of heads, suggesting a raptor taking off with a serpent in its claws. A modern imitation of an Angkorian Garuda and Naga sculpture stands at the entrance to a bridge in downtown Siem Reap. Garuda is mounted just above Naga’s central head. Again, the impression is of a raptor with a serpent in its claws. A multi-headed Naga is positioned on the edge of a building at Banteay Srei. Note the gigantic serpent coiling down from the left. One of Naga’s heads flares its hood, bears its fangs, and bulges its eyes in a display of anger. Another multi-headed Naga looks out from a corner at Banteay Srei. The leftmost head is missing, presumably having been hacked out by looters. This gigantic non-hooded serpent may well be Vasuki, the king of the Nagas, who aided in recovering the elixir of immortality from the Ocean of Milk. It may also be a Makara, a mythical aquatic monster similar not only to snakes, but also to fish and crocodiles. A bas relief at Banteay Srei depicts the horrible story of the slaughter in the Forest of Khandava, as reported in the Mahabharata. This detail probably shows the Naga prince Aswasena making his lucky escape following the heroic self-sacrifice of his mother. Here is the tympanum showing the forest as Agni burns it to the ground. To the left and right, Krishna and Arjuna kill the creatures trying to flee the conflagration. Toward the top, Aswasena makes his getaway. The famous “naga bridges” of Angkor Thom and Preah Khan depict the Devas and Asuras hauling on the body of Vasuki, king of serpents, in order to obtain the elixir of immortality. Here, the Rakshasa Ravana anchors the line of Asuras. A bas relief at Angkor Wat shows Varuna, the god of the ocean, riding off to battle in a chariot drawn by a multi-headed Naga (perhaps Sesha, the great serpent who is said to bear the entire Earth on his head). Varuna’s charioteer appears to ride on the Naga’s back rather than on the car itself. A Khmer sculpture in stone shows Buddha meditating as Mucalinda the serpent king opens his hood to shield him from the elements. Such a statue originally served as the central religious image for the temple called the Bayon, until later iconoclasts broke it and threw it to the bottom of a well.